As seen on ABC,MSNBC,KFLY,KATC,Wake up with Al,America Now,NPR Radio,Metro UK and most major USA news stations! All of the profits from my art go to help animals and people in need. I am a handicap rescued squirrel that paints pictures after mimicking my artist mommy.I became famous after video of me painting went viral.I have been on ABC,MSNBC,KFLY,KATC,Wake up with Al,America Now and almost all the major USA news stations! Over 70,000 hits on youtube ain’t nothing to sneeze at. I have had video of me and my story shown on virtually every major news network. 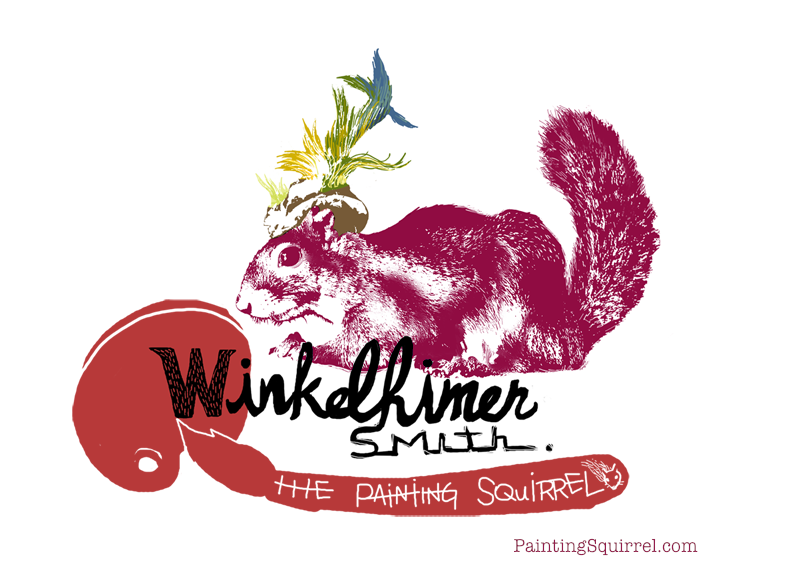 My momma rescued me from a cat when I was a toddler squirrel and so my artist adventure began. Every time I paint a new painting I get my pic taken with it while I’m working on it so you know I really did it.My squirrel mommy also signs it for me and glues one of my shed tail hairs to verify authenticity. All of the money I make goes to help other critters or even people in need!!!! My Squirrel Mommy’s story of how she came to be my Squirrel Mommy. “Everybody asks how I got a pet squirrel.I was standing at the kitchen window doing dishes or something and I saw a baby squirrel climb down the tree.This really foul stray cat we take care of was looking at it.So I banged on the window which usually the big squirrels know it means to run back up the tree.Well I guess because she was so little she was stunned.Before my eyes I saw Mr Rat pick her off the tree by the arm.I ran outside in my boxer short pj’s to get her out Mr Rat’s mouth. He had her by the arm I tried doing the thing where you put your fingers in the back of their jaw where they had no teeth,I tried grabbing the back of his neck,I tried jiggling him. So Finally a combo of all 3 got him to let her go.She fell out of his mouth and I though she was dead but I saw her breathing.I grabbed her bare handed and just ran to the porch yelling pleaseeeeeee don’t bite meeeeeee!!!! But she was so stunned she didn’t even move.I put her in a cardboard box and bought her into the house.We hand fed her like a baby and gave her some kitty infection meds we knew you could to give to a kitten so we gave her that.We did not thing she would make it but wanted to try and help her and at least make her comfortable. And that was the April 24the which was the Sat before easter 2011 and she been with me ever since. This is VERY adorable. Im very glad you rescued her. The work she’s doing is great.